I love having the time to learn new things. This is the season for macadamia nuts, so I decided to explore. 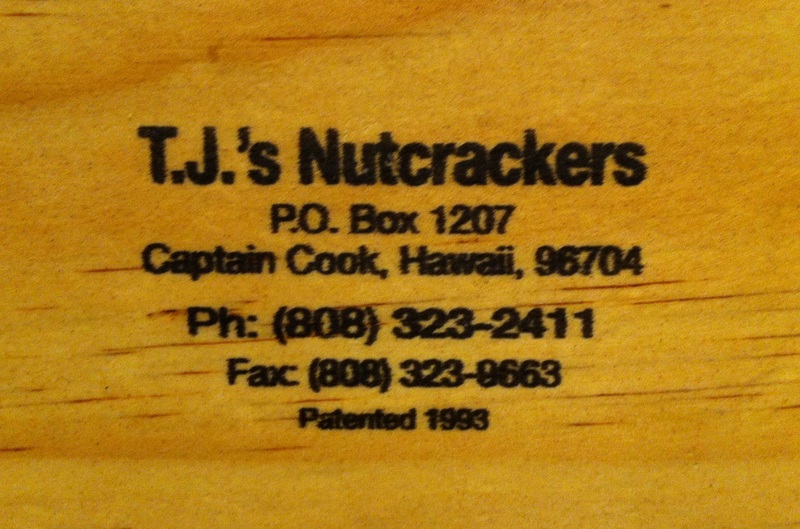 Before I moved to Hawai‘i, these nuts seemed so exotic – exotic, expensive and hard to find. On the Big Island, where they take up half the agriculture land that’s in production, they’re available everywhere, but still expensive. Until now. A friend wanted one of my avocado trees. I always seem to have little ones sprouting up. I gladly dug one up for her, but she wanted to reciprocate. “I have a mac nut tree – do you want some nuts?” Wow, do I ever! When Rebecca showed up with a garbage bag a quarter full of nuts in their hard little shells and a mac nut cracker, I was in heaven. This is a beautiful tool. I’d seen Tony using one at the Taro Patch Gift Shop where he patiently cracked nuts between customer visits. 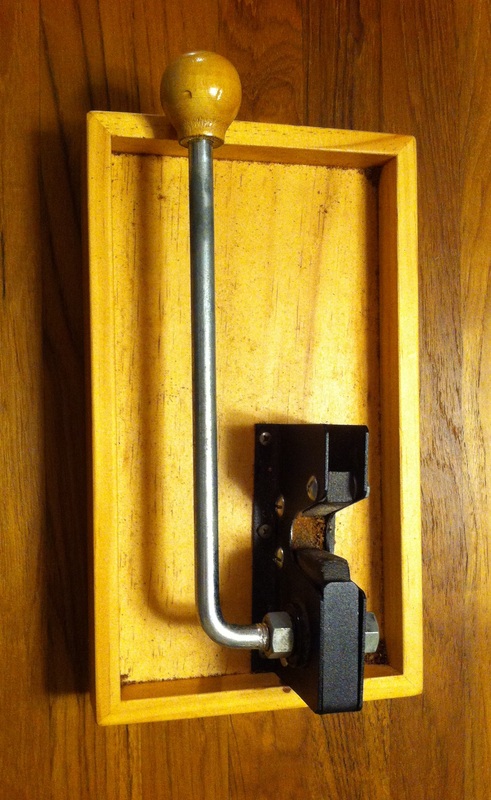 I showed the vise to my husband of “Mr. Tools-Are-Us” fame, knowing he’d appreciate the craftsmanship. But his first response was, “Oh no, this is your project. If you think you’re going to rope me into cracking your nuts, you’ve got another thing coming.” Well, maybe I did hope for that, just a little. None the less, late that night I heard the sound of crack, crack, crack, and smiled as I snuggled deep into the comforter. The next morning, I found a bottle of mac nuts soaking in olive oil. ??? 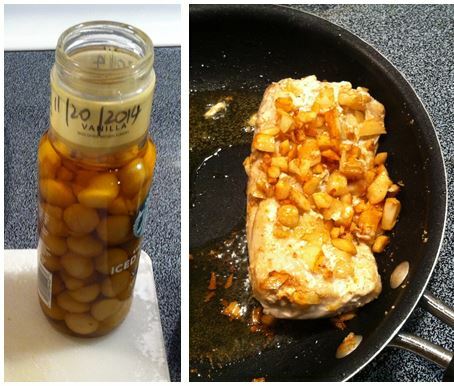 Three weeks later I chopped the oiled nuts and topped our supper’s mahi-mahi. Very tasty, though next time I’ll chop them smaller, and frankly, that’s easier to do with non-oily nuts. 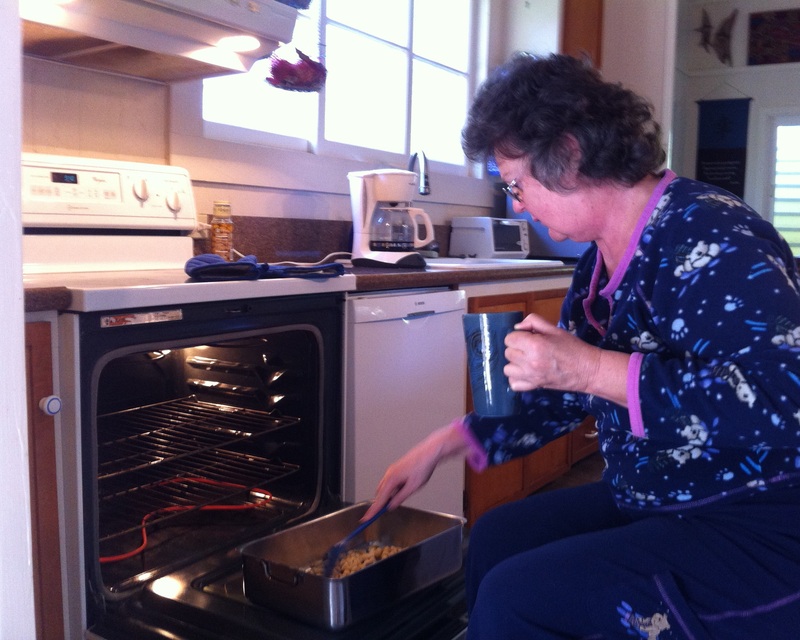 So in the morning, I sat in front of my oven with my first cup of coffee, the heat taking the chill off the house. The cream-colored nuts glistened in the light of my oven as the oils seeped out, and the smell of mac nuts filled the kitchen. I zealously stirred them every couple minutes. As soon as the first nut turned brown, I pulled the batch out, shook a bit of salt on them and began eating. I learned a few things with that first batch. First, the nuts stay hot for a while – be careful not to burn your tongue. (Patience has never been my strong suit. And, of course, it never will be if I keep saying this affirmation. So let’s just cancel that thought.) Second lesson: roast the nuts in batches of similar sizes. While the halves were perfect, the whole nuts were still chewy inside. At that point, we had to return the cracker to Rebecca. 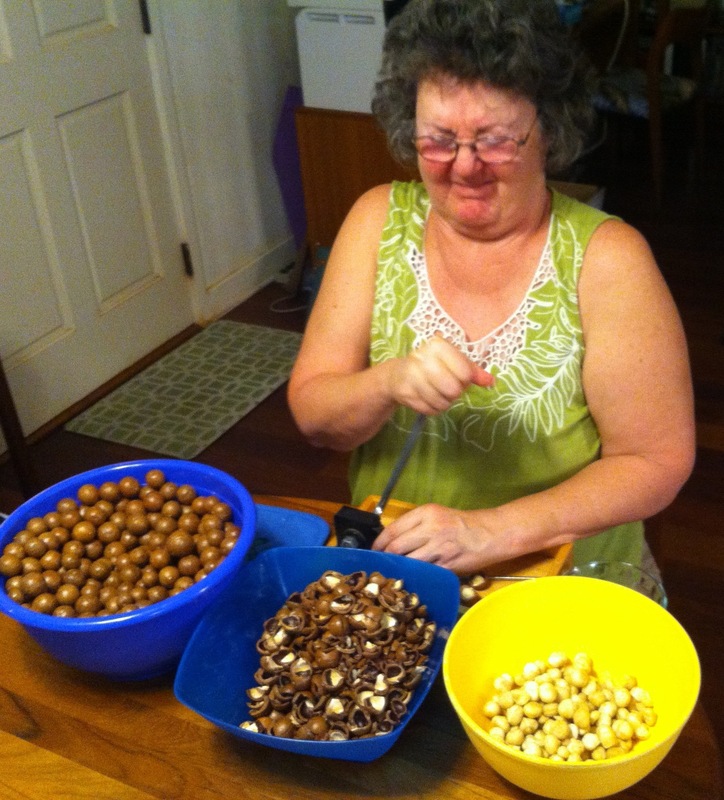 She had big plans for cracking nuts while watching football. Ever the Southern Belle, Rebecca tapped into her heritage and created the most fantastic pie from a pecan pie recipe. She shared it at a Women’s Circle, and left us all in a mac nut pie stupor. By the time she loaned us the cracker again, we had eaten all the nuts from Experiment 1. I researched mac nut roasting on the Internet (link 1, link 2, link 3), and was ready to apply my new learning. The main thing is to dry the nuts before roasting them. You can even dry them in the shell. That will allow them to shrink a bit and make it easier to crack the hard shell open. Maybe I’ll try that with Experiment 3. Meanwhile, I set up cracking operations at the table and worked steadily. After an hour of cracking, I even remembered to turn the vise around and switch to my other hand to develop both biceps equally. The most worrisome part was my concern for poking my eye out with a piece of flying shell. I asked Mr. Tools-Are-Us for a pair of safety glasses, but all he could produce was five face shields. ??? No thank you. I just trusted my glasses to stop them but it didn’t keep me from flinching every time I got to a really tough nut. 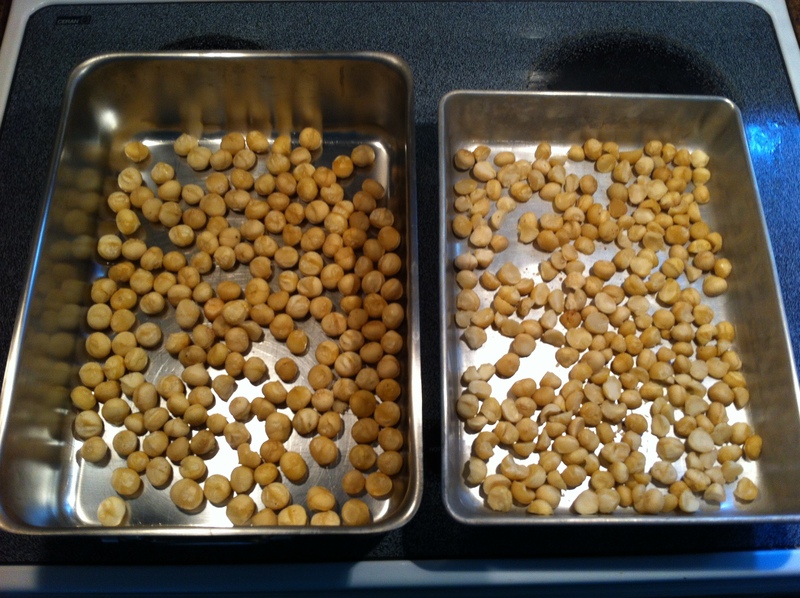 I separated the nuts into three sizes: large, small, and schnibbles, which coated another batch of fish for supper. Using the lowest setting on my electric oven, 170 ̊F, I dried the large and small batches in single layers for two hours at the same time, then left the large nuts in for a bit longer. I stored them in separate Ziploc Freezer Bags in the frig, and will roast them in small batches before serving. Apparently they last up to a year in the freezer, but these won’t be around long enough to test that. Before returning the nut cracker to Rebecca again, I flipped it over. 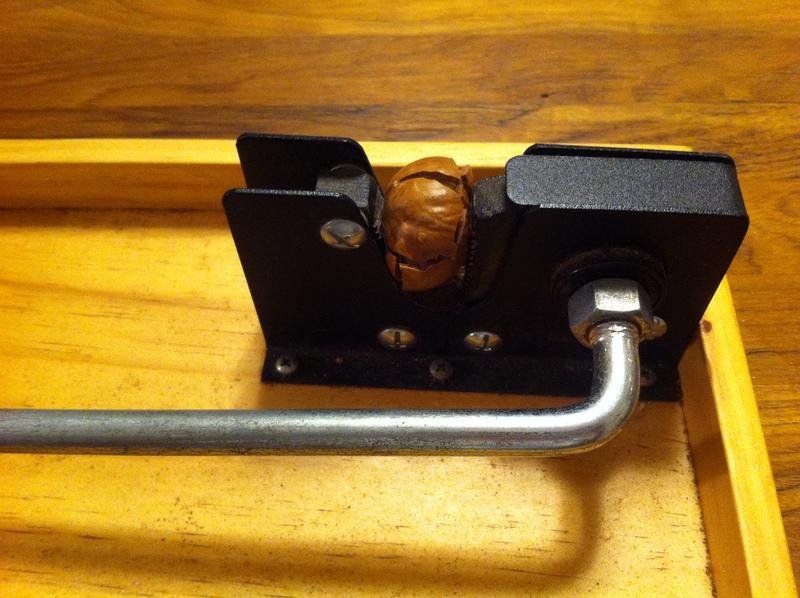 Turns out the hand-crafted mac nut cracker is available at a little shop in Captain Cook. I felt a field trip coming on. So Saturday, after a quick call to confirm directions, the girls and I piled into the Civic and headed halfway around the island. 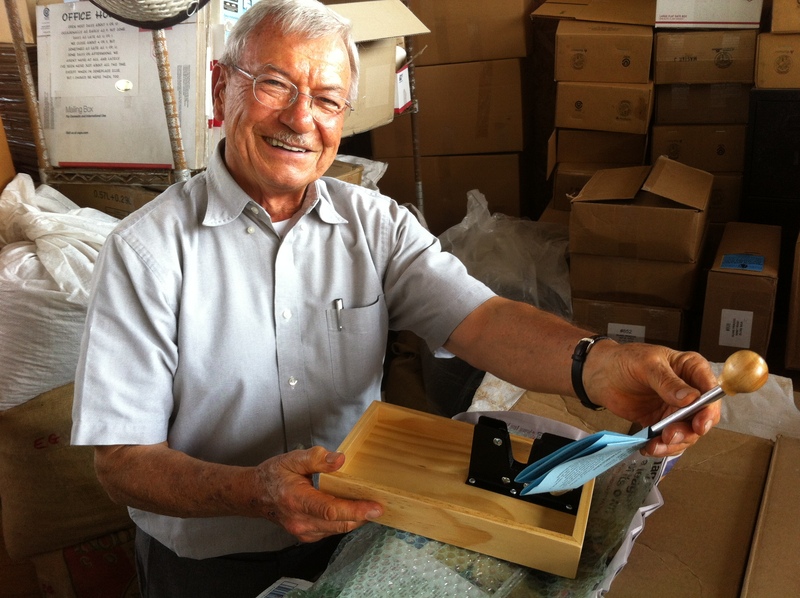 The sweet German shop owner, Emmerich Grosch, was delighted to teach us about nuts and nut crackers. He guaranteed that the one he sold was the best available, made in Australia, where the macadamia nut tree originated. 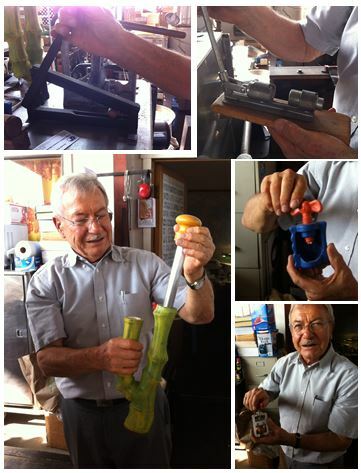 Mr. Grosch proudly showed me his nut cracker collection: heavy duty crushers, tiny screw vises, a slingshot model, even a ceramic style that looked vaguely like a hookah. Each one had been designed for the very hard macadamia nut shell, though none compared to the one he sold. Then he turned to the girls. “You know, you can crack about 24 pounds of macadamia nuts in an hour – nothing difficult, just an easy pace. 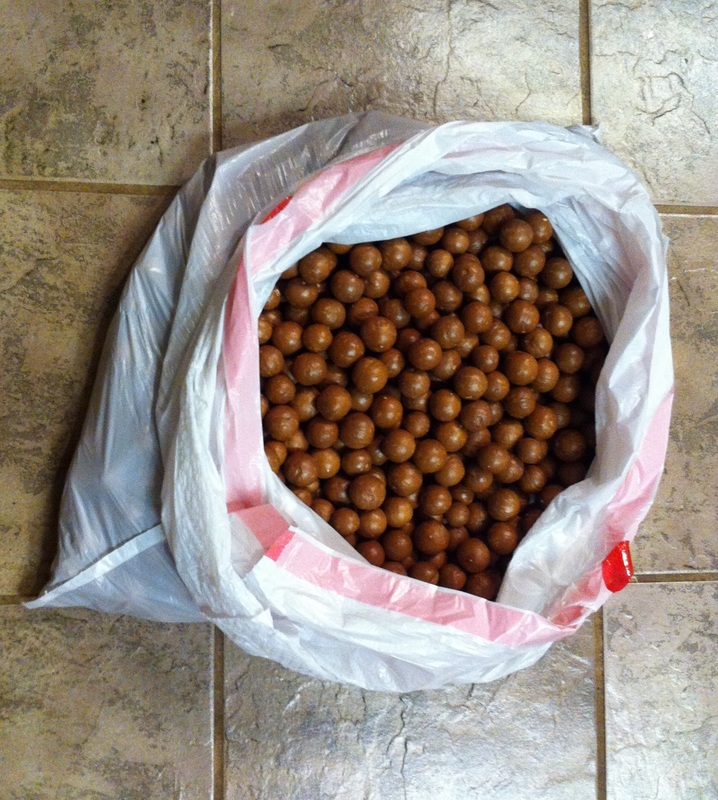 That 24 pounds of nuts will give you about seven pounds of nutmeat. If you put one pound in a bag, and sell the seven bags at $10 each, you can make $70, just with one hour’s work!” He gave them the full analysis that made them $75,000 a year with minimal effort. I’ll have to keep that in mind. What a Dear. We talked about our mutual German heritage, and I reminisced about Dad making sauerkraut from scratch (he used a 32 gallon garbage can for large batches), and sultz, a kind of meat jello that Dad made for Christmas. Yes, I bought a nutcracker. It solved one of my holiday problems – I hadn’t yet picked out a gift for BG. And, ever since I went gluten-free, I’ve found it a pain in the patoot to bake Christmas cookies. It was always a chore, but when I couldn’t even eat them, I had zero motivation. Now I have something else I can make, eat and share with guests. Of course, my supply will only last so long, and I’m out of unshelled nuts. Hmm. I wonder if Rebecca needs another avocado seedling. Or, taking the long view, maybe she has a mac nut seedling she could share. Happy Holidays, Merry Christmas, Happy Hanukkah, Joyful Solstice, Restful Makahiki, whatever you celebrate – enjoy this time of year. I am grateful for my academia on this topic: Rebecca, Tony, Mr. Grosch and the Internet. This entry was posted in eating in Hawaii, friends, German and Czech heritage, gratitude, Holidays and festivals, learnng new things and tagged home processing macadamia nuts, Living on Hawaii Island, Macadamia Nuts. Bookmark the permalink. Thank you Barbara. 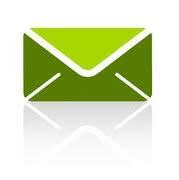 The same to you and Ray.